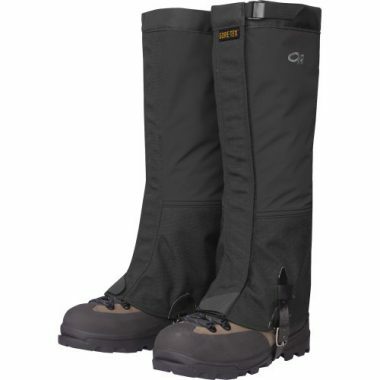 Gaiters are a simple but highly effective way to stop any dirt or water getting into your boots. They will ensure that you stay as comfortable as possible throughout your hike so you can enjoy the experience. They can vary quite a lot in design, however, so finding the best hiking gaiters for your situation is important. In order to find the best gaiters for hiking, it involves making sure their height, material and style suit you, among many other factors. Thankfully we are here to explain them all and have developed a buying guide to give you all the information you need. Once you’ve read through this guide, you’ll know exactly what you’re looking for. 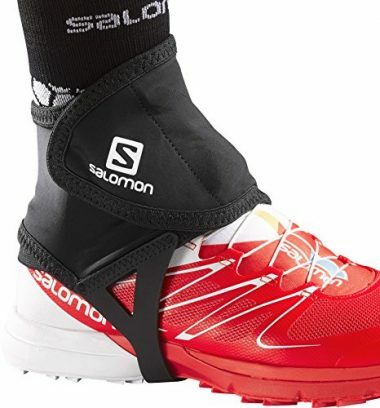 Salomon have produced these gaiters which are simple in design but highly effective for those looking for support from the top of their shoe. There are a few different color options available and enough size range options too. They are low gaiters which have an elastic band underneath them and then a very easy to use velcro strap over the top. Qshare have produced a much higher gaiter here which is going to be able to give protection to your whole lower leg. They have an adjustable fit with an instep strap which will be able to go under your boot. 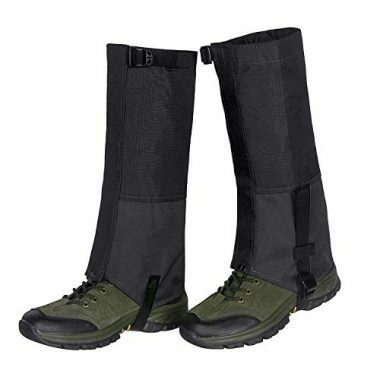 They are made from heavy-duty nylon that is waterproof and these gaiters also come with a secure bottom tab and a reinforced hook. Unigear have produced these top rated gaiters for hiking which tick every box in terms of what makes a great gaiter. They come with a bright color selection as they are available in blue and green as well as the usual black. They are waterproof and highly durable as they are tear and water resistant. 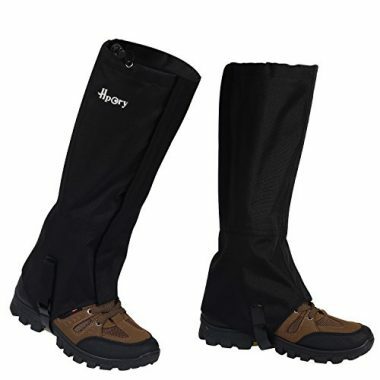 They are lightweight and easy to use and are an overall great pair of gaiters. 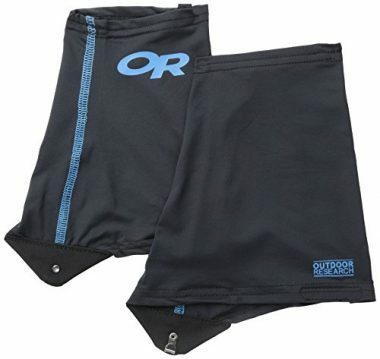 Outad have produced these great trekking gaiters which come in either blue, grey or black. They are made from a nylon fabric which is both waterproof and breathable but also highly durable too as they will be tear resistant. They are easily adjusted and fit well with a metal hook at the bottom which will be able to fasten to your shoe lace. 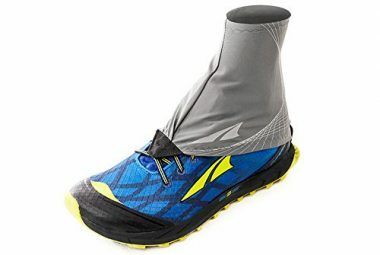 In terms of hiking gaiters reviews this is one of the best products on the market which is due to the fact that they are highly effective at being able to keep dirt out of your shoes and your feet dry. They have an instep strap which is highly adjustable and comes with a reinforced bootlace hook along with a bottom shear tab which secures front closure. These ultralight gaiters are much lower than other designs but are still able to give you a great degree of protection. This product is also available in a vast range of colors so you will be able to choose something which matches your style. They have a strapless design which attaches to your laces and contain spandex which will cling to your leg. Outdoor Research have produced these brilliant lightweight hiking gaiters which have the typical high leg design. The fabric contains Gore-Tex which will allow it to be breathable but also waterproof too in order to protect you from the elements. The gaiters are highly durable with their abrasion resistance and are very easy to fit and will securely stay on your legs. Outdoor Research have been able to produce these very impressive lower leg gaiters which are made from nylon and have a reinforced boot lace hook which will be able to give you an easy attachment. The materials are durable, water resistant and breathable to ensure that they will last you for a long time and be able to do the job they were designed for. 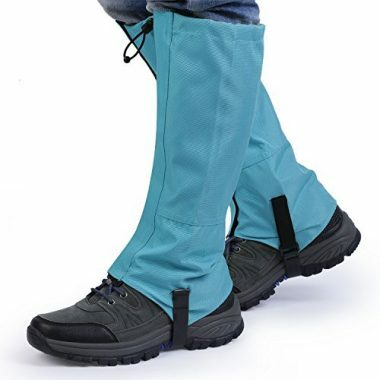 These waterproof gaiters are going to be able to be highly resistant to the weather as they will be able to deflect away any dirt or sand but they are also will be resistant to the likes of snakes and mosquitos too. The gaiters are very easy to use and you will be able to place them over your boots in no time and have that protection to ensure you have a comfortable hike. 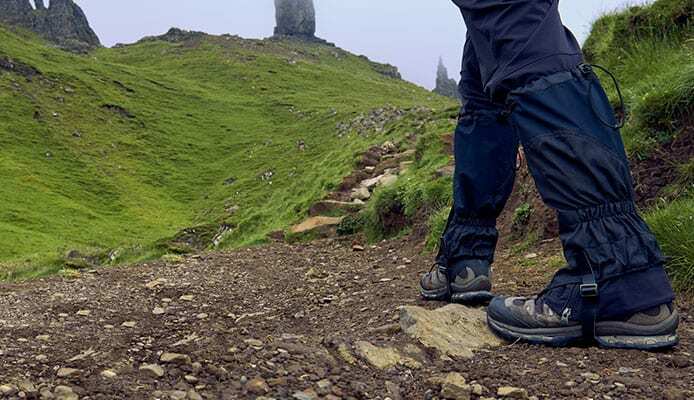 These backpacking gaiters are another great product from Outdoor Research and another which are easily able to attach on to your feet due to the spandex that they have on them. They are breathable and lightweight with hook and loop patches so that they can be easily secured to your boots. 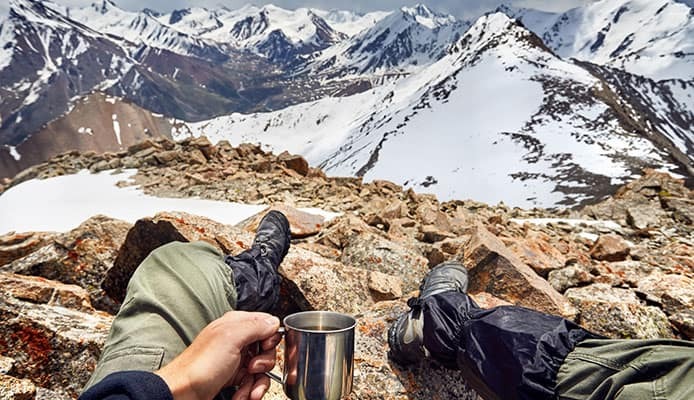 In terms of the material used with these hiking gaiters, they are usually made out of nylon which has a great balance of being an inexpensive material but also being durable and light which is why it’s seen in so many camping products. Oxford cloth and polyester can also be used but it’s important that they are treated to ensure that they are waterproof which is vital. They need to be durable too and therefore the material being think and/or blended with ripstop is ideal. In terms of the thickness of the material, this is rated by denier which you will see as a ‘D’ next to a number after the fabric. The higher this number, the better, as you want your gaiters to be durable but that additional material does add weight. Spandex can also be blended into the materials in order to add some stretch for a tight fit, but this is usually seen on the smaller models. The height of your gaiters is important and this generally depends on what type of hiking you’ll be planning to do. 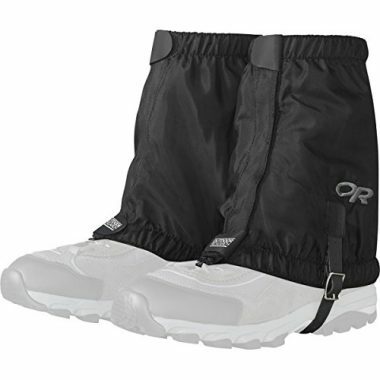 Gaiters which just go over the ankle are great for trail running for hiking when the conditions aren’t too bad. Gaiters which come up to the middle of your calf are ideal for more serious conditions when you need that extra protection to ensure that you keep the dirt and water out of your boots. These gaiters are usually between 8 to 12 inches tall. The largest ones will come up to just under your knee and are designed for you to be able to hike through the roughest of conditions where you will be walking through snow or you need to protect your feet. As with any gear when you are out there hiking, you want it to be as light as possible and that is the same when it comes to your gaiters. All the products that we have listed here are very light as they have been made from high-quality materials. As you can imagine, the smaller gaiters tend to weigh a lot less which is why it’s a good idea to use them if you can. This isn’t absolutely vital though as in comparison to the rest of your camping gear, gaiters aren’t going to have a significant percentage of your weight. Your gaiters should be easy to use as you should be able to slip them on over your legs and secure them easily without having to take too much time. It could also be that you need to adjust them while you are wearing gloves so you want them to be highly functional. In the past a lot of gaiters were made out of leather and a lot of them had zips which made them a lot more difficult to use. More modern designs use a mixture of spandex and velcro to ensure that you are always able to get them off and on as quickly as possible. The need for reinforcements will depend on where you will be hiking and what you plan to be doing. If you are going on a regular hike then it’s unlikely that you would need any extra protection for your legs as the thick material would be able to give you the protection that you need. For more serious hikes and climbs though it’s a good idea to be able to look for extra reinforcement of your gaiters, especially if you are going to be wearing crampons which can put into the fabric easily. Having something such as Kevlar added to the material can protect against it. For most hikes though, just having a tear resistant fabric will be enough. In terms of what is going to affect your buying decision, the style of your hiking is going to be one of the biggest as this will affect the level of protection that you need. It could be that you are a casual day hiker who only likes heading out when the sun is shining or it could be that you’re a more serious backpacker who likes to go out in extreme conditions. 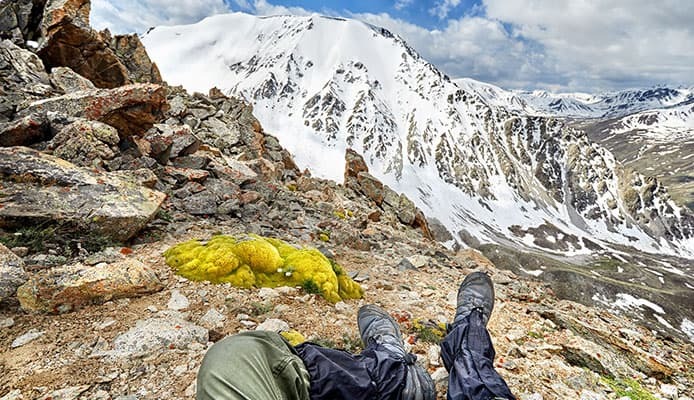 Your gaiters need to be able to match the type of hiking that you plan on doing and if you are trying to hike in snowy conditions, then it’s probably not going to be the best idea to have gaiters which just go over your ankle. You also need to think about what are legs will be traveling through, as if you are off the usual path then you might want to think about having protection from sharp branches and animals. As we have seen before, there are three main types which can be used which generally depends on the length of the gaiters. Other aspects apply though such as the materials that they are made out of and how they will be secured to your legs. In terms of the type it can often be tempting to go for the lightest and easiest option. With hiking though it’s going to be the best idea to take the cautious approach just so you can make sure that the gaiters are going to be able to give you the protection that you need. In terms of that protection, there are a few things that you want to make sure of when it comes to your gaiters. They act as a physical barrier to not only dirt but can be effective in protecting you against sharp objects and animals too. As we mentioned before you want to ensure that they are going to be high enough to give you the protection you need so that nothing can get into the top of them. Following that the thickness is important as if you are going to be doing anything dangerous, you need the gaiters to be able to cope with that. Also the seal of the gaiters is naturally going to be a very important part as you want it to be tight enough so that nothing is able to get past and into your shoes. This can vary from one product to the next and is especially important if you are in wet conditions. Your gaiters are there to protect you and make sure that you are comfortable so the whole point of them is for them to come into contact with things that might damage them. For most people, having material like ripstop nylon will be able to provide you with the durability you need. If you are going through tough terrain though there are other options like canvas with can be more durable. You also want to make sure any potential weak spots are well-made too and having strong buckles and reinforced hooks can be the difference between your gaiters breaking or staying strong. Simply put, all gaiters should have a good level of water resistance as this is to a key feature as to why you would wear them. In order to get the best protection you want to make sure that they are the correct length and also that they will provide you with a tight enough seal. That seal shouldn’t be too tight that it impairs your movement though as that wouldn’t be comfortable. No gaiter is going to be able to completely protect your feet from getting wet as if you are travelling through the snow or the wet, this is inevitable. One key feature that is probably underrated when it comes to gaiters is that they need to be breathable in order to give you the right level of comfort. They are covering your feet which means if they are not breathable then they could well keep moisture trapped inside your boot due to the sweat. This would completely go against what they were designed for which is why it is such a key feature. The gaiters are there to make your lower leg more comfortable so if they are failing in that take then they’d be no point in wearing them in the first place. The fit of your gaiters obviously plays a role in your comfort too. The smaller ankle ones often have spandex and a simple strap while the large ones will have a buckle and a cord on them to keep them in position. Whichever option you choose it needs to be tight to your leg and your shoe but not too tight that it becomes an annoyance. Picking the right size is very important as getting the wrong fit can be that they will either be too tight to be comfortable or they would be too loose to be effective. Q: What Are Gaiters And What Are The Benefits Of Using Them? 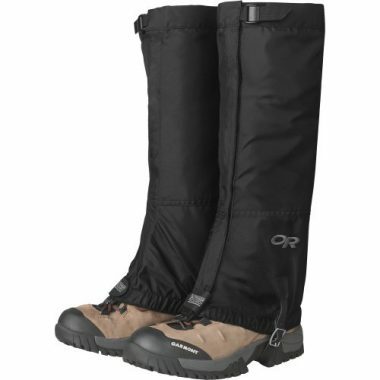 A: As we have seen here gaiters can be very useful in making sure that you have a comfortable camping experience. In short, they are material which will wrap around your leg to stop anything from getting into your boots. Getting dirt or small stones in there can cause blisters and soreness, and getting water in your boot can make them highly uncomfortable and also give you foot problems. 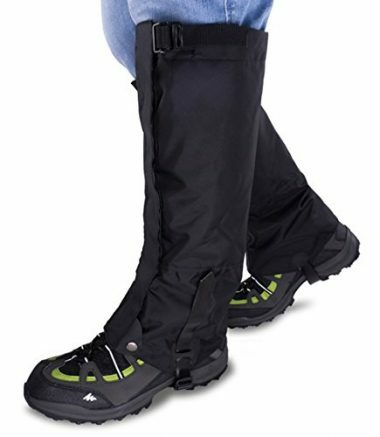 Gaiters are a protection against that and a very useful hiking feature. Q: How Do I Clean My Gaiters? A: Once you take your gaiters off it’s a good idea to inspect them to ensure that they aren’t damaged from your hike as they are an item which is intended to take a lot of punishment. Thankfully they don’t have any direct contact with your skin, so washing them is quite easy. They can be simply washed down with a damp cloth with some mild soap if required to get rid of any dirt and it is best to avoid machine washing them as they could ruin the product and they have metal attached to them too. A: All gaiters will be able to give you a high amount of water resistance and if they don’t have that then you should simply move on and look for a different product. Some have a better level of waterproofing than others and if you are going for an extreme hike then you will want the highest level of protection. For all other, the usual level of water resistance will be more than good enough. Hiking gaiters can be an extremely useful addition to your hiking set up, especially on backpacking trips when you will be spending more time outdoors. The importance of them increases with the difficulty of your hike but so does the height requirements of them too. You want to be able to add them to your hiking pants to make you fully prepared for harsh weather along with your hardshell jacket. A lot of the features of hiking gaiters are dependent on your specific needs with your hike. If you are in extreme conditions then you want them to be as high as possible and you’d also be looking for the highest level of durability and waterproofing. That being said, you also need to make sure that they are comfortable too and getting the right fit is important. They are there to give you a more enjoyable time when you are hiking and therefore you need to apply your own circumstances to what would be the best gaiters for you. When you choose the perfect pair for you, you’ll see the difference and won’t have to worry about stopping to clear out any debris from your shoe and you won’t be getting your feet wet anywhere near as often. Hopefully this guide has given you all the information that you need in order to buy your gaiters with confidence and enjoy the most comfortable hike you’ve ever had.